After the energy crises of the 70's, Walt Biggers, the brilliant visionary director of the Subaru Technical Center saw the potential for diesel engine powered passenger cars. I was commissioned to convert the standard gasoline engine to diesel in an effort to stimulate Fuji Heavy Industries (FHI) into considering diesel engines. By using a pre-chamber injector design, we were able to use the standard bottom end of the gasoline engine without modification. Major modifications were made to the cylinder heads and pistons to accomdate the pre-chamber and injectors and to achieve the necessary compression ratio. Parts for three engines were built. The first engine was installed in a vehicle for testing on the dyno and the road. After the initial tests, I installed a turbocharger to increase output and efficiency. The photograph shows the engine in it's intial specification. The second engine went to FHI where it served our intended purpose by spurring them to start a diesel engine development program. We were pleased that our engine performance equalled the performance of FHI's first engine. Their development continued and eventually a market acceptible engine was developed. In the meantime, however, market pressure had reduced, and the program was eventually dropped. 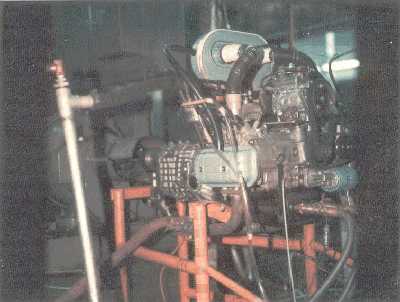 Above is a photo of the second engine on the dynomometer at FHI.